This antique technology, called a Campbell-Stokes sunshine recorder, helps researchers maintain North America’s longest-running weather record. 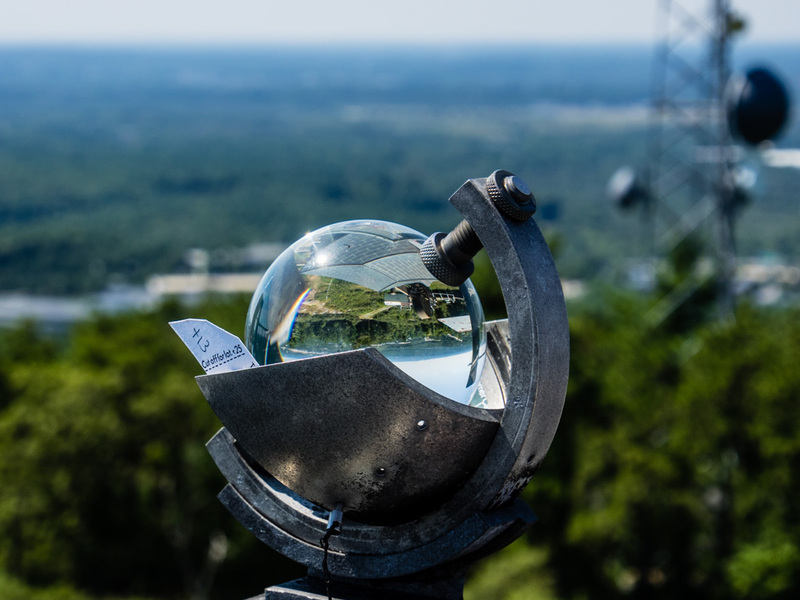 The crystal ball on a hilltop outside Boston doesn’t look into the future, but provides an invaluable connection to the past. This antique technology, called a Campbell-Stokes sunshine recorder, helps researchers maintain North America’s longest-running weather record. Blue Hill Observatory, in Milton, Massachusetts, has been gathering weather observations since February 1, 1885. Wherever possible, observers use traditional methods and tools, from a 127-year-old mercury barometer to a precipitation recorder that winds with a key. They could switch to modern technologies. But sticking with the old ways reduces variables that could affect the data, giving the long records a consistency that scientists love. The observatory has used a Campbell-Stokes sunshine recorder since January 1886. Sitting on the roof of a three-story tower, the device works just like frying an ant with a magnifying glass, as chief observer Brian Fitzgerald likes to tell groups of visiting kids. The glass sphere focuses sunlight into a narrow point. That point lands on a paper card that’s specially treated so it won’t freeze, melt in the rain, or catch fire—quite. As the sun crosses the sky, it scorches a track along the card. Only bright sunlight leaves a mark. When you can’t look straight at the sun, then it’s probably intense enough to burn the card, says Michael Iacono, a climatologist and observer who volunteers at the observatory. Each day an observer slots a new card into the device. Later, the half-hour hash marks on the burned card are used to estimate the minutes of bright sunshine for that day. The observatory reports the number to the National Weather Service as a percentage of the time from sunup to sundown. Although the observatory’s sunshine record dates back more than a century, it doesn’t tell the complete story. Iacono recalls a night in July 1993 when, after he went off duty, some teenagers managed to scale the tower and steal the Campbell-Stokes recorder. The staff scrambled to buy a new one (luckily, identical devices are still manufactured). Twelve days later, another recorder was in place. “The funny part of the story,” Iacono says, is that four years earlier the observatory had been made a National Historic Landmark—giving it federal protection. Once word got around that the FBI was looking for the sunshine recorder, he says, “the kids brought it back right away.” The staff put the two devices side by side and confirmed that they burned identical tracks; now the old recorder sits in the observatory’s history room. Iacono is working to digitize all the detailed daily records for the sunshine recorder. The aging logs have turned up some surprises—for example, that the recorder on the rooftop is not really the observatory’s second, but its third. The original seems to have been replaced after only about 12 years of service, due to seared glass. Iacono analyzed the newly digitized data from 1889-2012 in a recent paper. The records clearly reflected the “global dimming” of the 1960s through the 1980s, when air pollution reduced the sunlight reaching the earth. The data also showed that years with major volcanic eruptions had fewer clear days. The ongoing research can help scientists understand how the earth is responding to climate change, Iacono says. The past century’s temperature increase might have been even greater without these periods of dimming. Observers at Blue Hill intend to keep adding to the dataset by doing things the way they always have. “There’s an unbelievable value,” Fitzgerald says, in using the same instruments and techniques “for as long as possible.” In fact, even the analysis of the Campbell-Stokes cards involves another long-serving instrument: chief observer emeritus Bob Skilling, who’s been reading the scorch marks for close to 60 years. Elizabeth Preston is a freelance science writer in Massachusetts. Her blog, Inkfish, is published by Discover. The history of the dinosaurs is being rewritten by young scientists digging up new discoveries in the golden age of dinosaur fossil hunting. These dazzling tiny bees are major pollinators.